Like a groovy alien from a distant star, Beck dissects humanity's past, present and future on The Information. Or he could be describing a parallel universe. Or maybe he's on an Isaac Asimov jag. And, really, whatever strikes you as true is what matters. From its blank, graph-paper liner notes and book of 60 stickers to its everything-but-the-kitchen-sink instrumentation --- and I wouldn't be surprised if some of that percussion was a kitchen sink that went unmentioned --- The Information invites you to explore it, ponder it, make it your own. 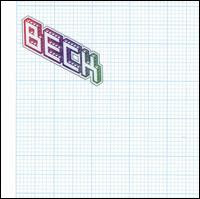 Easily the most nuanced of Beck's albums, The Information repeats and reinvents elements throughout. The beginning of "New Round" recalls "Sunday Sun" off 2002's Sea Change. The intro to the final song reincorporates synth squiggles from the third track, "Cellphone's Dead." Beats, bass and programming wizardry disappear and reappear, sometimes in the same song. Despite the album's hour-plus runtime and overall static feeling, it's never boring. Just when you think you can predict how a tune will go, Beck throws in a harmonica part, or something with glockenspiel, or a Game Boy. Producer Nigel Godrich, renowned for his work with Radiohead, layers the sounds so that none sticks its head out of the mix. He himself contributes tambourine, whistle, background vocals, Speak & Spell, Tote-A-Tune and effects, of which there are many. Perhaps the most fascinating aspect about The Information is its ability to create inertia. While that's not a quality many artists would seek for an album, it works well with Beck's themes of space and time. There's percussion all over the album, yet a haze subdues it. The electronics tether everything, as if by one of Newton's laws. Splitting the album between rhyming and singing, Beck embarks on an odyssey through "civilian jungles with malaria pills" and "up the tin-can mountaintop." Neanderthals figure in, as do robots, the ubiquitous cell phone, a jukebox, soldiers, infidels, ghosts, space ships and the Almighty. He scolds people on "Cellphone's Dead" who "phone it in like it's unlimited minutes," and he frets about a woman on the sweet and upbeat "Think I'm In Love." On "Strange Apparition," he says a prayer while the music approximates a haunted player piano in an intergalactic saloon. Then he breaks out some furious free association on "1000BPM": "Consultants revoke their souls with unanimous votes / portions of the proceeds go to chain-store victims / in remission conditions with remodeled kitchens." But the crowning achievement might be the last track, the dense, ambitious, long-form composition "The Horrible Fanfare/Landslide/Exoskeleton," which passes the 10-minute mark. It metamorphoses from a tribal soundscape to a vehicle for a wicked guitar riff to ambient noise and trippy dialogue. Whether Beck's a "seasick sailor on a ship of noise" or "uptight, super-gutted, out of the frame," he can refract the world through his prismatic personality and take you back to the future. Today or tomorrow, it works either way.